Boise has to be one of the more surprising towns in Idaho. While Coeur D'Alene was my favorite, Boise comes in a close second (Coeur D'Alene's built on the side of a beautiful mountain with a gorgeous lake right below). But what made Boise such a surprise was the ambient downtown area with a nice selection of good places to grab lunch on an outside patio. They also "seemed" to have a decent selection of coffee in the downtown. But oh, how I wasted my coffee stop on Thomas Hammer Coffee, a chain out of Spokane, Washington that looks more like something Target shot out in its spare time. The place looked good enough on the corner right across from the Capital area with a snazzy, corporate look on the inside but the appearances were so deceiving. The coffee is roasted up in Spokane and from the look and taste, they're fans of over-roasting (when your website has to advertise which coffees are "smooth", it's a bad sign in my estimation). The coffee I sampled wasn't horrific, but it definitely lacked tasted and quality. The espresso on the other was horrific, as the barista seemed to be fresh off the assembly line with not a real clue on how to pull a decent shot (really, really overpulled). On the note of the barista on duty, one should not work alone if one does not know how to make everything on the menu (especially one of your signature drinks!). Succinctly said, don't waste your time with Thomas Hammer. I love Thomas Hammer a lot more than Starbucks. The Thomas Hammer location in Spokane and Post Falls know how to properly make a cup of coffee. It depends on which loaction you visit. 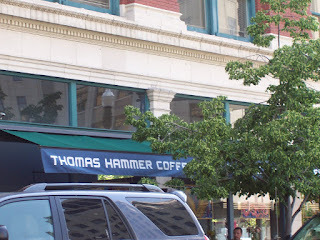 I would rather spend my money on a cup of coffee from Thomas Hammer than from Starbucks any day! Thomas Hammer knows how to stir in the flavors rather then let it sit on the bottom of the cup. They also have a nice varity of teas. Just because the location down in Boise sucked, don't write it off your list until you come to Spokane and try it from the true headquarters! I usually buy Starbucks coffee beans..but since they've made Sulawesi a "seasonal" coffee, I had to go a shoppin....Thomas Hammer may end that search! Into the store we went, with a cup of Dawson Taylor coffee in hand..well..we dumped it in the sink after tasting TH's "La Revolucion" !! Time will tell the whole story, but for now...I'll be drinking that! It is very interesting for me to read the blog. Thanks for it. I like such themes and anything connected to them. I definitely want to read more soon. It was very interesting for me to read the blog. Thanks the author for it. I like such themes and anything connected to this matter. I definitely want to read more soon. Nice post you got here. It would be great to read a bit more concerning that matter. Thnx for posting that material. I'm a student at WSU and the most common coffee on campus is Thomas Hammer...It's not horrible, but it's definitely the definition of mediocre. It reminds me of complimentary waiting room coffee. So sad to hear you visit sucked. I love to visit Thomas Hammer! I might not be a coffee expert, but I enjoy there coffee... a lot. Fortunately I have had only good baristas serve me, and in such an unpretentious manner. Some of my favorite coffee shops in Seattle, Portland too, lack a certain detail called being nice. If it weren't for their good coffee i'd never go back. I may not be able to tell you the difference between a true ristretto, or a lungo, is it? But this Thomas Hammer fits my needs perfectly! As uaual some hick from Boise seems to have all the answers, just drink some of Starbucks crap. I would guess the problem is that maybe the barista was having a bad day. Since you had a poor experience maybe going back another time, or purchasing some of the roasted coffee, might be in order. Lastly I don't see you mention any local coffee shops in Boise, why not see if you can shop local and support small business instead of giving Starbucks you money.